Galaxy Bath LTD 4 Brewery Mews Business Centre St. John`s Road Isleworth TW7 6PH. COMPLETE GROHE WC CONCEALED TOILET FRAME + GROHE EURO CERAMIC S COMPACT RIMLESS WALL HUNG TOILET PAN WITH SOFT CLOSE SEAT 7IN1 SET. Video will open in a new window. 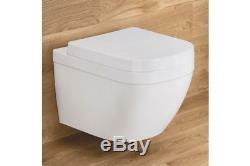 Benefits of Euro Ceramic WC wall hung - YouTube. PRODUCT DESCRIPTION Rapid SL 5-in-1 set for WC flushing cistern GD 2 with small maintenance access 1.13 m installation height for on-the-wall installations or studded walls powder coated steel frame, self-supporting for dry-cladding, completely pre-assembled with fixed connections for single or rail installation quick adjustment, lockable fixing material TÜV approved 2 WC fixing bolts fixing device for ceramic distance of fixing bolts 180/230 mm outlet bend Ø 80 mm depth adjustable reducer Ø 80/100 mm inlet and outlet connecting set flushing cistern GD 2, 6 - 9 l adjustment ex factory 6 l and 3 l pneumatic discharge valve offering 3 modes of operation: dual flush or start/stop or non-interruptible water supply from left/right or back low noise group I acc. To German Noise Specification DIN approved insulated against condensation ½ water supply connection including integrated angle valve and push fit flexible hose union no tools required for the installation of the inspection shaft incl. Protection during construction phase, for vertical or horizontal use accessories for on-the-wall installation with GROHE Fresh retrofit set for chlorine-free tabs only including wall plate Skate Cosmopolitan for dual flush or start & stop actuation vertical and horizontal installation 156 x 197 mm chrome made of ABS GROHE StarLight® chrome finish WC set for noise protection. Compact design with powerful flush and rimless technology the GROHE Euro Ceramic wall-hung compact WC The GROHE Euro Ceramic wall-hung compact WC is perfect for upgrading small-space bathrooms or cloakrooms. A wall-hung WC enhances the sense of space and measuring just 430 x 370mm this sleek model fits the bill for smaller spaces. In glossy Alpine White vitreous china, the WCs rimless technology gives germs nowhere to hide, making cleaning easy and guaranteeing improved performance, while the GROHE Triple Vortex flush uses three water outlets to create a a silent, powerful, splash-free vortex that cleans every corner of the bowl. The flush volume is 5/3L and the WC comes with a fixation set included. The GROHE Euro Ceramic collection has been designed for a seamless fit with GROHE Arena Cosmopolitan flush plates and GROHE Rapid SL installation sets, for complete aesthetic harmony and ultimate performance. By choosing GROHE ceramics you benefit from GROHEs global expert in sanitary fittings, plus 100 years of technical excellence and expertise from LIXIL, the leading brand in surface technology. GROHE Euro Ceramic modern, distinctive design to fit your lifestyle perfectly. Ideal for combining with the GROHE Euro Ceramic Compact WC seat with SoftClose feature (39458000) or GROHE Euro Ceramic Compact WC seat (39459000). GROHE PowerFlush guarantees perfect hygiene The GROHE PowerFlush toilet has an innovative bowl profile and two or three water jets which combine to create a spinning vortex of water that cleans the whole pan perfectly every time. Make cleaning super easy with the GROHE Rimless WC Hygiene and cleaning made simple! Less dirt collects on a rimless WC and the flush performs better too. Choose the GROHE Rimless WC for a bathroom that sparkles all day, every day. Grohe Euro Ceramic S Rimless Wall Hung Toilet Pan Grohe Euro Ceramic S Soft Close Seat Cleaning is effortless with the GROHE Euro Ceramic Compact WC seat with clever QuickRelease seat and SoftClose Sleek modern style conceals useful features and easy-clean design in this GROHE Euro Ceramic Compact WC seat, the ideal pairing for a compact toilet in a small bathroom and designed to perfectly complement the rest of the GROHE Euro Ceramic range. Made of durable Duroplast, the seats Quick Release feature makes cleaning easy the seat is attached to the pan with a quick-release hinge. In addition, GROHE SoftClose ensures that the lid and seat move slowly and smoothly, avoiding slamming noises and trapped fingers. The seat includes a stainless steel fixation set. Ideal for combining with the following GROHE Euro Ceramic Compact WCs: 39206000/00H. 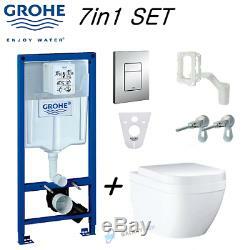 Complete Grohe Rapid SL WC 1.13m Dual Or Single Flush 1.13m Installation Height Front Actuation MPN 38528001. Grohe Fresh System MPN 38796000. 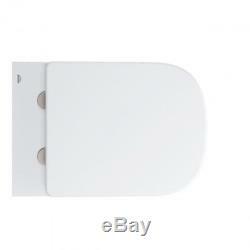 Grohe Skate Cosmopolitan Chrome Horizontal/Vertical Dual Flush Wall Plate MPN 38732000. Grohe Wall Brackets For Against The Wall Installation Of Frame MPN 3855800M. 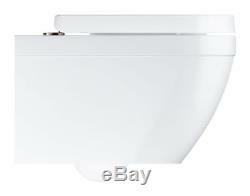 Grohe WC Bend MPN 37131000. 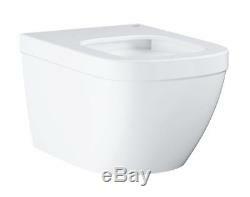 Grohe Euro Ceramic S Rimless WC Wall Hung Toilet Pan MPN 39206000. Soft Close Seat MPN 39458000. Apply only for orders placed by 1pm. 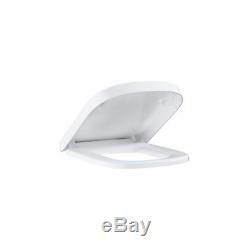 The item "GROHE WC FRAME & GROHE EURO CERAMIC RIMLESS WALL HUNG TOILET PAN SOFT CLOSE SEAT" is in sale since Thursday, April 26, 2018.